Suncast’s innovative hybrid designed extra large deck boxes combine cedar wood with resin to accomplish the natural beauty regarding the gorgeous tones of tradition with the durability credentials resin beholds, providing a protective base and top for weather defence. 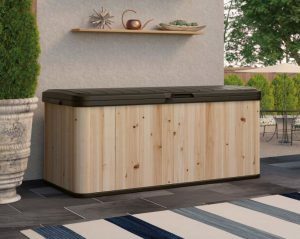 Suncast’s hybrid deck box integrates a weatherproof resin base and lid armouring the essential structural parts of the box to subsist against weather attack with a surround of cedar wood, the most low maintenance of natural woods. Two models represent Suncast’s Hybrid range both are very similar dimensions, the only real difference relates to the lid, one model has seating molded into the lid as the images further down display however they both provide seating. If cedar wood was plentiful at a reasonable price we would probably never have seen resin sheds entering the market. Purchasing a walk-in shed with a cedar construction tend to spiral costs into another price bracket altogether however it doesn’t substantially affect a deck box this size. Suncast recommend you preserve the natural cedar wood with either paint, stain or seal before placing outdoors and using. 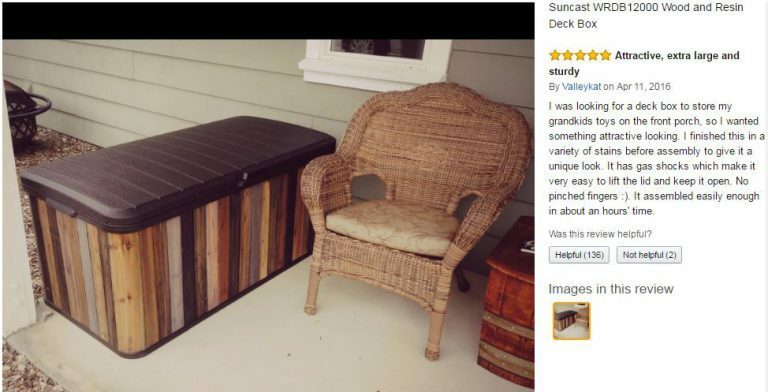 In the USA prices section reviews contain photos regarding customers making their own statement of style with different shades of wood stain. There’s some stunning designs providing inspiration. We stripped a 1960’s Ercol Sideboard down last year from dark stain to the most beautiful wood grained textured finish revealing handcrafted dovetail joints. Rather than covering up the natural style by re-staining we opted to apply a couple of coats of natural turpentine oil to nourish the wood, it looks sublime, presenting us with a great idea to administer the same procedure with this deck box. 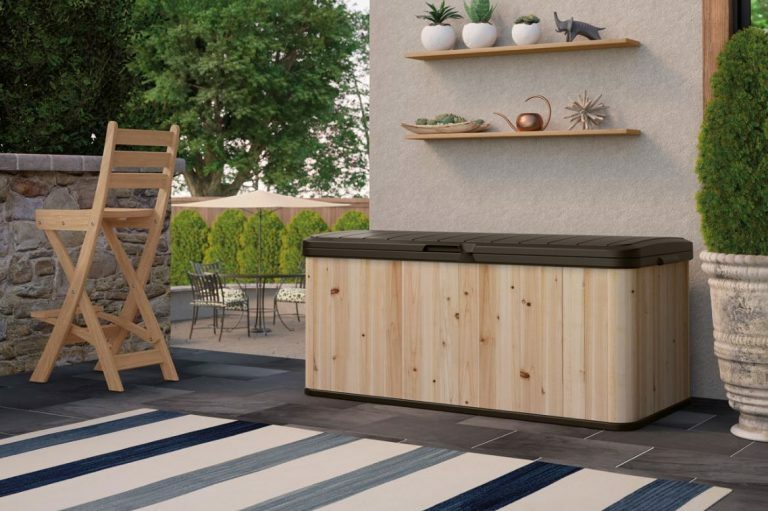 I read reviews across a wide spectrum of websites relating to this style of low maintenance storage solution, their locations and usage both indoors and outside are plentiful, it’s down to individual preference regarding different ideas of service. One lady said she has purchased three, one for upstairs accommodating bed linen clearing her wardrobe for additional space, one downstairs in the home entrance for outdoor clothing and boots etc whilst the other’s situated on the patio harboring accessories. The purchase of 2-3 deck boxes is a very common occurrence. A popular location for this deck box regards sitting in a conservatory displaying the stylish natural wooden design whilst serving to maintain a clean space, holding games, books, magazines and the likes. 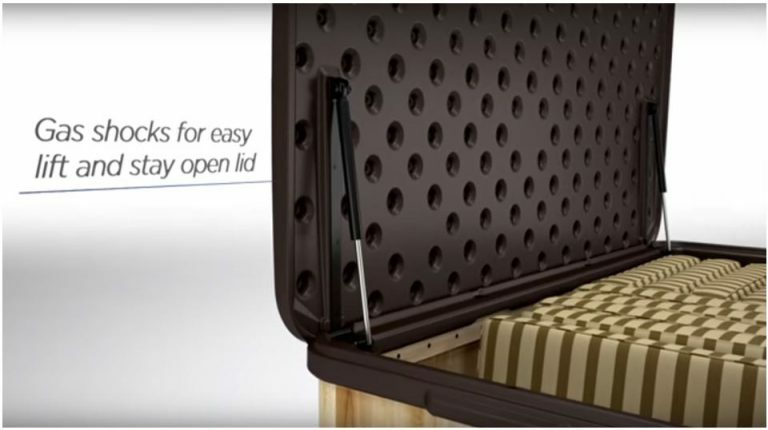 It’s favourable situated on a balcony reaping the benefits of storage in tight spaces with seating ability. On a patio the dry aired internal ambience provides a perfect facility to store furniture cushions, seating fabrics and other accessories whilst another favourite location regards serving to distinction around a BBQ area, accommodating cooking utensils, the flattish top can assist as another table whilst Suncast describe: Reinforced lid offers a unique seating and storage solution. Instructions are vague trying to find a seating weight limit. 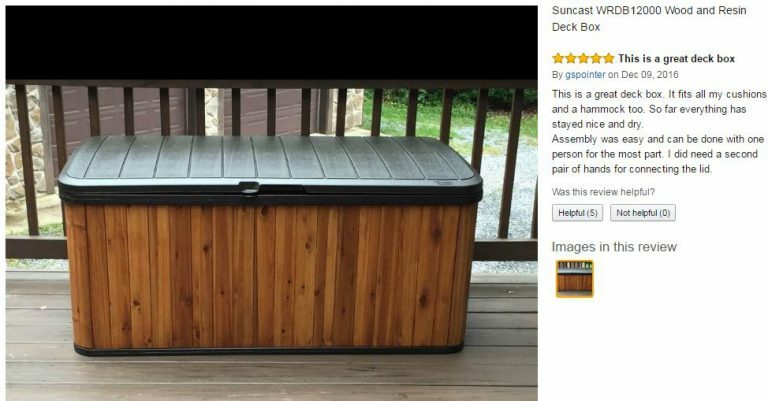 Suncast’s advertising page and video only mention it doubles up as seating leading to people asking how many people will this Deck Box support: 2 people with a weight limit between 300-400 lbs has been answered. As well as accommodating small gardening equipment, lawn supplies and kids toys many convert the box into an ideal log store during winter, these are just a few ideas providing inspiration to what people use their deck box for. Four sheets of cedar wood secured around four cedar corner posts make up the facade whilst the critical components relating to the base and lid safeguarding deterioration when subject to the weather elements are a polypropylene resin manufacture. Blow molded technology is Suncast’s benchmark where the resin sheets are molded into a dual walled lining accomplishing strength and stability to the overall construction. Due to the base sat on wet ground and the lid subject to weather attack, polypropylene resin withstands rust, rot and decay due to the weather-resistance make-up whilst UV protection qualities mixed into the resin mix resist colour fade and cracking when subject to the sun. The problem wooden deck box lids and floors have covering this expanse is their tendency to require yearly upkeep duties regarding re-varnishing and re-painting etc only to inevitably end up succumbing to decay further down the line, resin resists such problems. The facade’s vertical presence on the other hand allows rainfall run straight off unlike the floor and top resulting in minimal concerns to which oil or stain etc will preserve and combat. Suncast recommend applying a yearly coat of seal, stain or oil to the cedar surround to nourish the wood and preserve however cedar is very low maintenance and the time this takes to coat is definitely worth the small amount of work in my view. Gas shocks provide an easy opening mechanism enabling fab access, opening the lid to a near vertical position whilst the pistons ensure the lid stays ajar, creating a swift tidy-up for kids toys scattering the garden and super access placing furniture cushions inside. Upon closing the lid a molded resin clasp presented in both the top of the facade surround and lid adjoins together designed for a padlock to secure the unit. Padlock is not supplied. Whilst the contemporary design harmonies with most outdoor settings the sturdy make-up regarding the cedar corner posts and reinforced lid provide additional seating, a great solution where space is tight like on a balcony or where extra seating is beneficial around a BBQ area when friends have gathered. Although there’s more involved with regards to the amount of screws due to the cedar surround all parts are pre-cut and pre-drilled resulting in a pretty straightforward assembly requiring household tools compared with the alternative complete resin designed deck boxes, their construction’s a snip due to their interlocking advantage with minimal screws. Construction takes towards an hour yet feedback received admires the ease of assembly and excellent instructions. The procedure starts by making up the cedar surround and securing to the corner posts followed by adjoining the resin base, then fixing the pistons to the lid and securing to the box. 2 people are required to fix the lid to the box, one supporting whilst the other secures with screws. After finalising construction it’s a good idea to apply a coat of stain, oil or sealer to increase preservation qualities if the box is going to be stood outside, then just follow this sequence on a yearly basis. Competition-wise regarding combining a resin top and base with a cedar surround, Suncast are on their own however there is another deck box manufactured with a composite wood / polypropylene resin mix called the Brushwood Garden Storage Box exhibiting an ultra stylish design with 120 gallons storage capacity which maybe of interest. Here’s a page with links to full reviews regarding well favoured deck boxes, combining stylish designs with attractive displays. 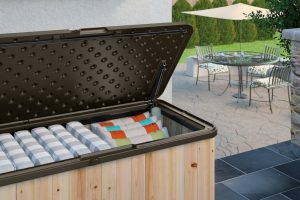 The Suncast extra large deck box boasts a 120 gallon storage capacity whilst doubling up for additional seating, a traditional appearance benefiting in weather attack places with the durability of resin. 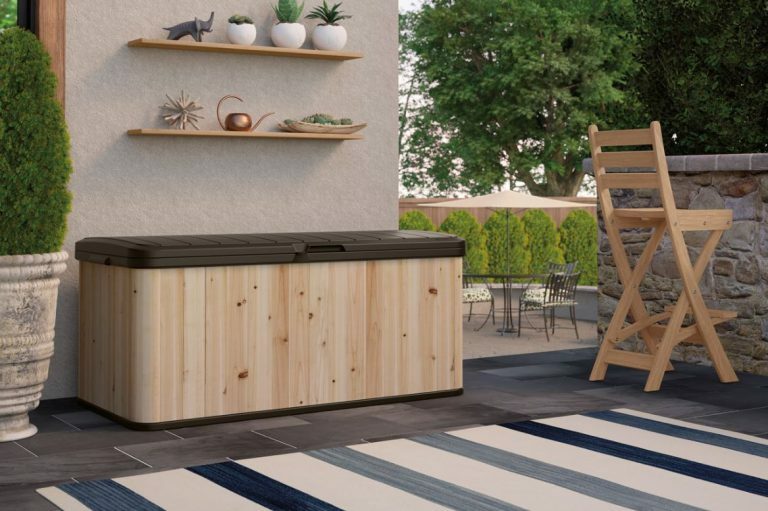 Superb feedback represented through reviews adore the stylish looks providing this deck box with oceans of eye appeal, destined to complement any surroundings whether indoors or outside with a dry internal atmosphere, critical for storage preservation. Access is superb, provided by the piston mechanism enabling effortless entry, the lid opens near vertical maintaining an open position resulting in great service whilst additionally benefitting for seating purposes. The only slight downside is the duty to apply a coat of stain, oil or seal per year to nourish the wood and preserve. Thanks for reading about this Hybrid Deck Box. If you have any questions, please ask in the comment section below. Always happy to help. This storage box is larger and less expensive than some other boxes I have researched. And, it has a wood finishâ€¦I love cedar! Other boxes I have seen are either wicker or plastic and it doesnâ€™t look to me like they will last as long or stay visually appealing as long as these Suncast boxes. Additionally, the other boxes are in the $200 to $300 range. I am definitely going to seriously consider Suncast for my storage needs! Thanks for reading about this delectable hybrid deck box manufactured by Suncast. Yeah, cedar wood is by far the lowest maintenance of woods, ideal for producing outdoor wooden storage units however the price for walk-in sheds made from cedar is so inflated, the reason plastic sheds have entered the market due to their competitive price and low maintenance values. 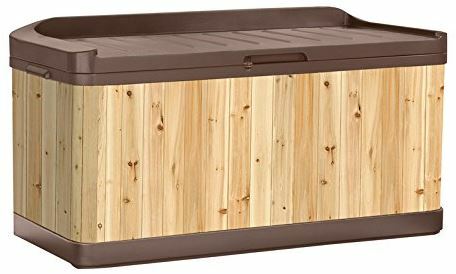 Prices don’t really affect a deck box such as this Suncast model due to the size however manufactured with a resin lid and base produces the perfect accompaniment with cedar to resist weather attack. The quick yearly job of oiling or staining the cedar wood will armour the surface with weather defence. I really like the look of this hybrid box. I’ve actually been looking to get something that would function as interchangeable between indoor and outdoor locations. This looks like a really cool idea. I actually have kids, though. So what I want to know is what the general safety of this box is. Does it have any sharp corners? Does it splinter easily? 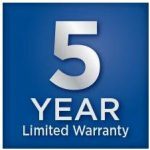 Thanks for reading about Suncast’s hybrid deck box. 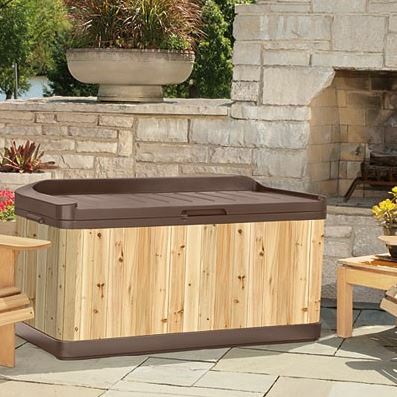 These deck boxes are so versatile presenting a multitude of storage potential. The Cedar wood surround is a fairly smooth surface due to being prepared, ready for applying a stain, oil or seal dependant on the appearance you wish for and to preserve the wood. 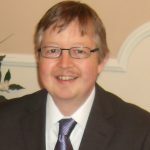 At the top of the facade walls to where the lid adjoins when shut is a resin surround therefore no splinters will be present and no sharp corners when opening the box. Feedback also admires the way the gas shock pistons prevent the lid slamming shut which is a great child friendly feature as a lid expanse regarding the area this deck box contains would be quite heavy if it slammed down, so this prevents fingers getting trapped too. I think this is as child friendly as any deck box on the market to be honest.